When Bruce Iglauer’s sister invited him to a music festival at the University of Chicago in the mid-1960s, he was exposed to the excitement and emotions of blues music for the first time. When he moved to Chicago a few years later, his fascination turned to obsession which turned into a business. More than four decades later, Alligator Records is regarded as one of the premier outlets for the “genuine houserockin’ music” that Iglauer fell in love with so long ago. 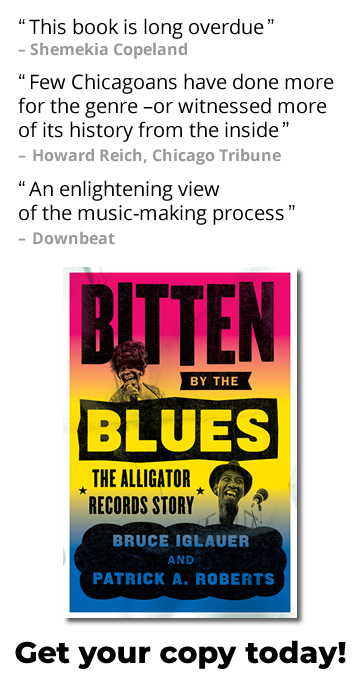 His journey, and the many stories that have come out of a life dedicated to the music and the musicians, is outlined in the new book, Bitten By The Blues: The Alligator Records Story. Bruce Iglauer: I heard there was a jam at a place called Florence’s Lounge on 54th and Shields… on Sunday afternoons. So I went down there, and the bar was just kind of sitting in the middle of the block. There were people outside drinking from half-pints in brown paper bags, and there was a dice game going on — they were throwing dice up against the side of the building. I pushed my way through the crowd, a lot of people in their Sunday finery, and I could hear the sound of a slide guitar, that sound of steel on steel sound. And just a rhythm that was undeniable-uptempo, danceable… and as I pushed my way through the crowd I discovered at the far end of the bar Hound Dog Taylor and the Houserockers. And I fell in love. Iglauer: Over a period of time, blues got to be an old-fashioned music amongst black people. Even by the time I moved to Chicago in 1970, I would hear from younger black people, “Oh, that’s grandpa’s music, that’s not my music.” Meanwhile the white audience — 60’s college kids like me — discovered blues and became a whole new audience for blues. Blues stayed in the black community to some extent, but over a period of time migrated in Chicago to the north side, migrated to college campuses, and to festivals starting with the Ann Arbor Blues Festival in 1969, and the artists became world travelers. They made a decent living, they enjoyed having a world (global) audience, and were happy for what had happened to them. But now, blues has become a music for old white people. I’m 71 now. I still think of myself as that 60’s college kid. But when I go to blues clubs I notice how many other people look like they’re 71 years old. If blues is going to have a future, both in Chicago and in the world, it’s going to do so by becoming more contemporary. By speaking more clearly to a younger audience. Listen to the Bruce Iglauer interview by Jason Marck at WBEZ.